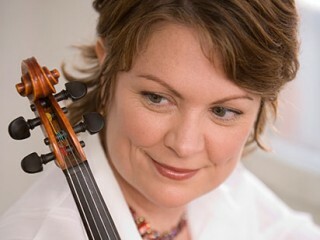 Eileen Ivers is an award-winning champion of Irish fiddle playing. Adept in every aspect of the form, she can perform a stirring set of reels or a plaintive ballad with the best of traditional players, evidenced by her prominent role in the popular Irish song and dance show Riverdance. However, when Ivers takes the stage to play her own set with her eye-catching, indigo instrument known as "Wild Blue," the slim, dark-haired musician could just as easily pass for a rock star. Decidedly not a purist, Ivers dives and weaves during solos, knocking out rapid lines like a blazing guitarist, her own personal style owing a bit to blues and rock in addition to Irish jigs. "I had a great teacher, Martin Mulvihill, and I was strongly grounded in the tradition," she told Don Heckman of the Los Angeles Times. "But I also spent a lot of time playing with rock bands and doing jazzy type things, too. And for me, Irish music lends itself very well to the use of a few blue notes here and there." View the full website biography of Eileen Ivers.